Green-and-white Volkswagen Beetles are no longer a familiar sight on Mexico City’s roads, and very soon, the Nissan Tsuru—the Mexican-market, early 1990s Sentra that has survived into the age of Twitter fights and organic bacon boutiques because of its cheapness and practicality—will be gone as well. It’s just not safe anymore, unfortunately. But it’s going out fancier than it’s probably ever been. The Tsuru has had a long run in Mexico, but last year it got dinged with a zero-star crash rating in the Global New Car Assessment Programme (NCAP) test. You can watch the results in the video above. 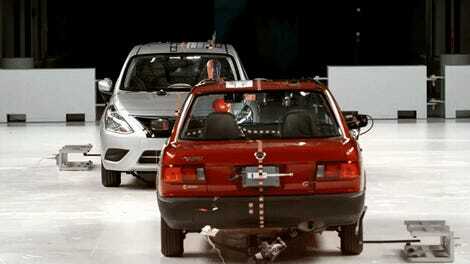 The NCAP says the Tsuru was involved in more than 4,000 deaths in Mexico between 2007 and 2012. Needless to say, it’s not something you want to crash, but it’s an example of how safe cars have become in just 25 years. So 2017 will be the final year of the Tsuru in Mexico and it’s headed out with a special edition called the “Buen Camino”, which means“Good Way” in Spanish. And man, is it a window into what cars used to look and feel like. The top model “Buen Camino” Tsuru starts at 172,500 Mexican pesos, roughly $8,500 in U.S. dollars, making it still cheaper than any new car you can find north of the border. Other Tsuru models are even cheaper. All kidding aside, this marks the end of one of the simplest vehicles you could buy in North America. The Tsuru got the job done for a lot of cab drivers, families and businesses. I have no doubt it will be missed. It’s an amazing example of how basic, rugged, utilitarian vehicles can exist on the market for decades, so long as you’re willing to completely disregard the whole “thousands of fatalities” thing. I look forward to importing one to the U.S. in 25 years, which I suppose will technically mean I’m importing a 50-year-old car. Put that in your crack pipe and smoke it, Elon Musk.